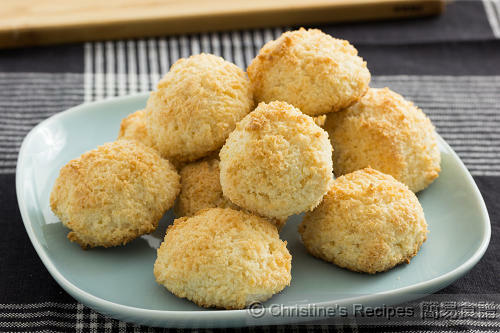 These coconut macaroons smell pleasant, taste not too sweet, crisp outside and chewy inside. It's good to treat yourself or your loved ones with this delicious snack. 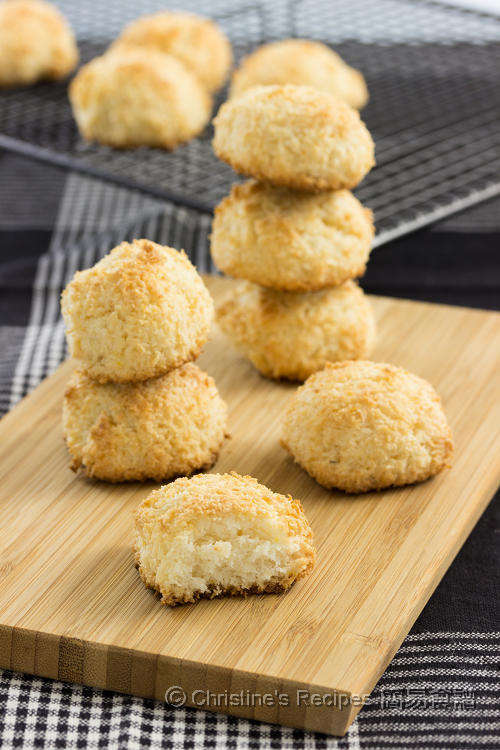 For those who like gluten free treats, these macaroons will be a good one to keep in your cooking list. I ate three in a row when they were straight out from oven. It’s perfect as snack with a cup of tea or coffee, or as finger food for a party. Use a large clean mixing bowl, without any trace of oil or water, beat the egg whites with an electric mixer until bubbles form. Add lemon juice. Gradually add the sugar, one-third at a time, and beat well between additions. Continue to beat until stiff peaks form. With a spatula, lightly stir in lemon zest. Sift in and lightly fold in the cornflour in three batches. Add the desiccated coconut. 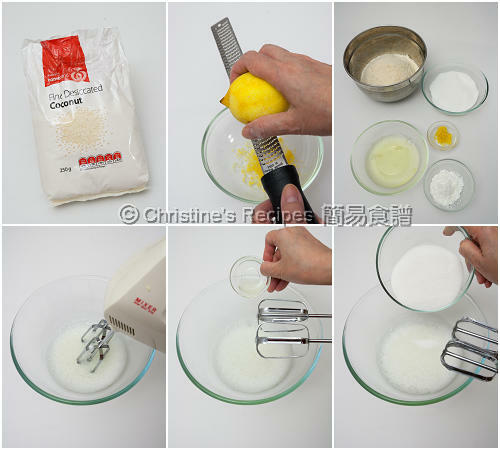 About how to beat egg whites, please refer to this video “How To Beat Egg Whites”. The leftover egg yolks can be used to make these pumpkin crème brulee. I am a sucker for anything coconut! 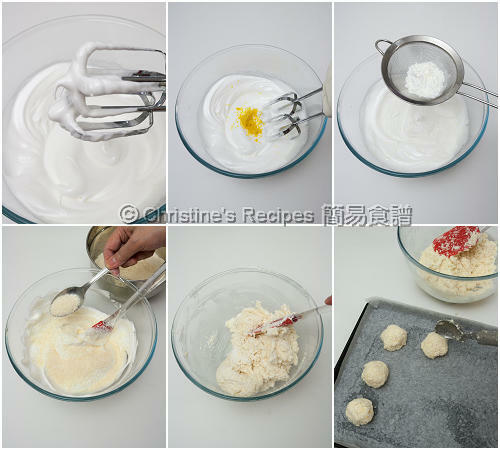 These coconut meringue cookies look awesome, Christine. Hi christine, is the desiccated coconut need to be fried with gula melaka before i can use it in the macaroons? No, you don't need to fry the desiccated coconut. Just mix it with other ingredients. Hi Christine Ho thanks a lot I have posted my photo of Macaroons on my page &addresses u pls do check it they where so beautiful &so yummy & tasty every one liked it so much.thanks love u &ur recipes. So glad that you liked these little coconut macaroons. They are absolutely delicious. I hopped over to your google+ page and viewed your photos. They are gorgeous. Hi Christine! I am honored u replied me. Hope u will be happy to know that I made few variations of this recipe. 1*I added custard powder like 1 tb . In replacement of 1 tb cornflour. Little yellow color &second time light pink color. 3*I added the fresh coconut flakes &grated coconut. Every time I got bea results &perfect. All the kids of my( inlaws) family they r around 14 to 15 + my huband+my mother side family they love & finished in blink of eye.thanks.see how these little coconut Macaroons (little sweet bombs )did magic. Very soft pretty balls.thanks again.👏a big round of applause 👏 from all those kids.nice to see u . Thanks for sharing your successful experiment. Theses little coconut balls are really excellent snacks for kids.